From cyber-bullying and hackers to arguments that it’s creating an impersonal, self(ie) obsessed society, far too often the World Wide Web gets a bad rap. And likewise, even though as we age it’s normal to feel out of touch with the trends of youth – when it comes to technology, the generation gap has never been wider than it is today. 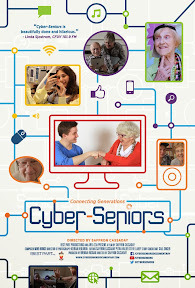 But instead of giving into contemporary criticism that the internet is driving the human race (and particularly the oldest and youngest generations further apart), in Canadian filmmaker Saffron Cassaday’s Cyber-Seniors, she documents the efforts of her two younger sisters to use the information superhighway to bring us closer together by introducing retirees to all the web has to offer. Having witnessed firsthand their grandparents' proud sense of wonder after discovering that learning the ins and outs of getting online would enable them to keep in touch with family members via Skype, e-mail and Facebook, in 2009 eighteen year old Kascha and sixteen year old Macaulee created a computer literacy manual to bring cyber independence to more seniors. Recruiting a group of likeminded friends, the teens set out to bring the web to elderly residents living in nearby retirement homes. And capturing over one hundred and twenty hours of film footage over ten months of shooting, director Saffron Cassady edited the work (which began as a personal, family-centric opus) into a brisk seventy-five minute feature film. Serving up an altogether wise, poignant and inspiring journey, throughout the film we get to know a handful of seniors as well as some of the organization’s good-humored, patient teen volunteers as the program grows and evolves under the additional guidance of the Cassaday daughters' mother. From the program's earliest days spent teaching seniors the basics as they learn the lesson that you can’t check your inbox by going to www.email.com all the way up through the results of a YouTube video competition, admittedly the work does lose a bit of focus as it meanders from one subject to the next. But whether they’re sharing wisdom or ironing up a grilled cheese sandwich, the personalities of the subjects come through as each senior finds a new cyber interest from Facebook to online dating or webchat that they’d like to explore in greater detail. Constantly dedicated despite some heartbreaking roadblocks that occur along the way – in a cruel twist of fate both Macaulee and her grandfather are diagnosed with cancer during the making of the film. By revealing in earnest exactly what the internet should do (which is bring loved ones together for support), suddenly the visual of the multigenerational Skype sessions between the loving grandfather and granddaughter during chemotherapy become that much more significant – wordlessly articulating the thesis of the work as a whole far more powerfully than any beautifully written narration ever could. To this end, although the YouTube competition evokes some creative entries, it also brings out a certain schoolyard pettiness and popularity contest among some of the retirees who should all be empowered rather than pitted against each other and Cyber-Seniors loses a little of its sweetness in the last act. Best when it derives its drama from real life rather than helping to manufacture drama, Cassaday’s well-intentioned picture flourishes when it illustrates the positive changes that cyber literacy has had on the lives of the program’s participants. From helping a disabled man quickly and easily conduct his banking online in an activity that used to require setting aside an entire day to helping relatives who have lost touch find one another (even if they might be embarrassed by what they find on their grandchild’s Facebook wall), it’s the little moments that make the movie. While it may be as difficult as learning a second language to some and indeed out of embarrassment and/or fear some of the senior students don’t return for lessons, in addition to celebrating the humanity behind the status updates and screen names of cyberspace, Seniors also makes those born in the era of the personal computer realize how much we take these skills for granted. Missing the traditional structural ingredients that would make it easily palatable to the same theatrical audiences that adored the demographically similar documentary Young @ Heart, the universal appeal of Cyber-Seniors in wide release is questionable because it’s fixated far more on the program itself versus a few central characters with natural story arcs. A lovingly made slice-of-life specialty feature that will hopefully make you consider offering to share some of the knowledge you take for granted in your own life with a member of another generation, Cassady’s work seems like it would be a perfect choice for either SnagFilms online or PBS’s Independent Lens series. Even though it reminded this lifelong volunteer once again that the generation gap may be wide indeed, Cyber-Seniors champions the fact that people can always find common ground regardless of age. For as once you begin trading wisdom and stories, you’ll begin to realize that others have as much to offer you as you do them in this era we call the Information Age... whether you're online or off.